One question remains, however: when these Kings of America do form a tag team, will they have the most American theme of all time? Mashing their current themes together, “We the People” and “Miracle” respectively, would result in “We the Miracle,” a title that certainly piques interests. But just imagining what this theme would sound like – French Rapping over the soundtrack to Fox News, does not speak to an American ideal. 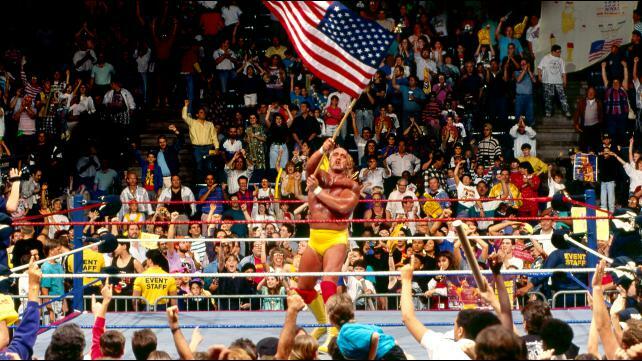 We decided to look into wrestling’s past – via theme music – to pick 5 Themes that speak to American Patriotism and also pro wrestling. Note: Out of respect for Zeb Colter (translation: fear of being hit with Antonio Cesaro’s European Uppercut), we are not including Lex Luger’s “I’ll Be Your Hero” on the list. While it was the theme for Luger’s American Patriot run against WWF Champion Yokozuna, Zeb Colter knows a hip-lock when he sees one. He will always have a 2×4 around. He will yell, “Hoooooo!” randomly. He is a WWE Hall of Famer. He is a proud American. 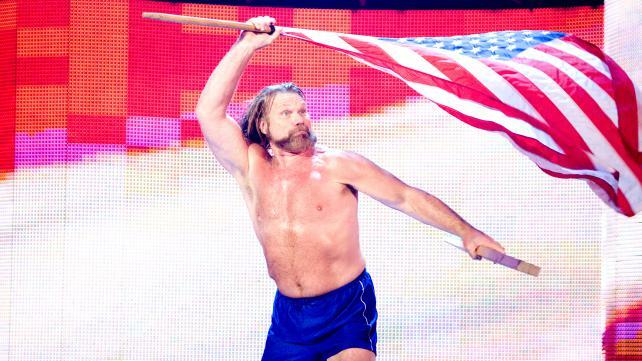 Hacksaw makes his theme sound more patriotic than it would be on its own because if you’re going to scream “U-S-A! U-S-A!” at the top of your lungs, “Two by Four” is a great choice to have playing behind you. His patriotism is so proudly displayed that he must spend his Independence Day marching in parades around Glenn Falls, NY, bellowing out his signature cry. Bet you didn’t realize there were that many syllables in the word “American,” did you? Or that much soul for that matter! The same could be said of the son of a plumber, Dusty Rhodes. When he faced off with rivals like The Nature Boy Ric Flair and The Four Horsemen or the Macho Man Randy Savage, it was clear that Dusty Rhodes was different. His opponents acted better than everyone and, frankly, looked fitter than everyone. Dusty didn’t. He looked like an American. And he fought like an American. He never gave up, he fought through pain, injury and broken limbs. 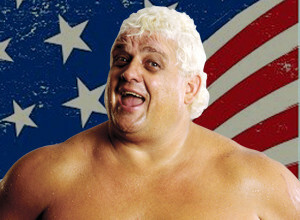 For all of his efforts, Dusty Rhodes has truly lived the American Dream: a world reknowned Superstar, a respected member of the wrestling community and a member of the WWE Hall of Fame. Not only that, but the Polka-dotted one has paved a way for his sons – Dustin and Cody – to also make a name for themselves in wrestling. Both have been successful in their own way, which a truly something a father, regardless of nationality, wants to see. Honestly, “Medal” almost didn’t make the list and it is all due to two words: Del Wilkes. 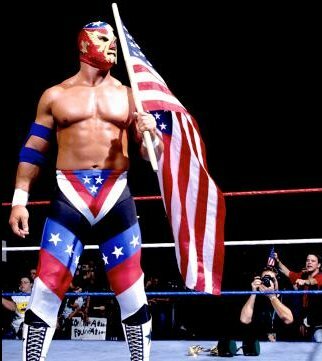 You see, Del wrested as The Patriot in both WCW, forming a Tag Team named “Stars and Stripes” with former American Male Marcus Bagwell. This affiliation almost got Bagwell kicked off the list as well but their brief run as a tag team is easily overlooked. After being unable to defeat Tex Slazenger, Shanghai Pierce or whoever else he lost to in WCW, The Patriot left for the WWF. Somehow, he was convinced that he could defeat then WWF Champion Bret the Hitman Hart, not because he was better than the best there is, was and ever will be, but because Bret was extolling Canadian virtues and Del Wilkes – being American – was better. Honestly, it was enough to make you consider defecting to Canada. In addition to causing tension with our Wrestling neighbors to the north, he also infuriated our neighbors to the south; this masked wrestler was routinely recorded without wearing his mask, which showed disrespect for the Mexican Wrestling tradition of wearing a luchador mask. Del Wilkes left many an American wresting fan without an option. until Kurt Angle showed up. An Olympic Gold Medalist Winner (for Wrestling!) arrived to the WWF and was given the same theme that The Patriot had. But the man of the 3 I’s – Intensity, Integrity and Intelligence – took this theme and out any bad luck or curse it had from The Patriot’s affiliation. Angle became a Superstar; whether he was your Olympic Hero or your Olympic Villain, he performed in match of the year candidate after match of the year candidate match, each time being led to the ring by the bombastic horns that introduce “Medal.” When we liked the theme, we loved it; when we hated the theme, it … sucked, no matter how many times it was remixed. Either way, “Medal” persevered, overcame adversary in an American fashion. It has become a theme song that’s now synonymous with a legendary wrestler, even if he hasn’t used it in a few years. There’s a theory behind Rick Derringer’s “Real American” aka the most American song in the history of Professional Wrestling; if played at the right time to the right person, it can inspire you to perform superhuman feats like say, lifting a car or lifting Andre the Giant at Wrestlemania 3. Indeed, Hulk Hogan was the perfect vessel for Rick Derringer’s American anthem. While “Real American” was not Hogan’s first theme song (it was “Eye of the Tiger”), it is certainly the one that he is the most associated with, especially given his successful runs in the WWF during the 80’s and 90’s. 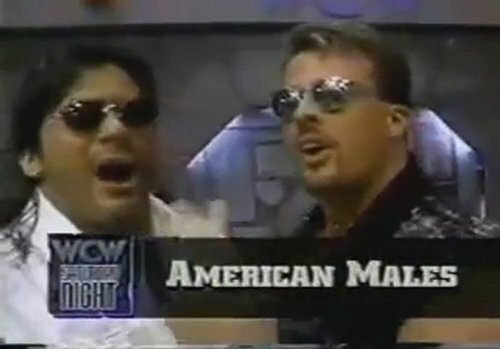 Even when he went to WCW in 1994, they gave him a song, “American Made,” which is as close to “Real American” as legally possible. Seriously, listen to it and you can hear the parts where “Real American” used to be. As a result, it did not have the same theory behind it; Hogan, though successful, ultimately dropped this theme for a coat of black spraypaint and Jimi Hendrix’s “Voodoo Child“, forming the nWo. Hulk Hogan isn’t the only one to use this theme song. President Barack Obama came out to “Real American” at the 2011 White House Correspondents’ Dinner. Kenny Powers came out to it while playing in a Mexican baseball league on Eastbound and Down. Indeed “Real American” is not only associated with the red and the yellow but also the red white and blue. This entry was posted in I Have Til 5 and tagged 4th of July, American Males, Antonio Cesaro, Cody Rhodes, Dustin Rhodes, Dusty Rhodes, Hacksaw Jim Duggan, Hulk Hogan, Jack Swagger, Kurt Angle, Real American, The Patriot, Zeb Colter. Bookmark the permalink.